The KA Electronics Input-Gain-Filter-Output, "MTC-IGFO," is a Mastering Transfer Console front-end with Swiss Army Knife flexibility. What does the MTC-IGFO do? The MTC-IGFO has a fully-balanced line receiver, individual Left/Right or Stereo Mute, a -5.5 to +5.5 dB gain stage designed for 23 step switches, +5dB gain boost, four relay-selected high or low pass filter stages (12dB/octave) and balanced output for driving an insert chain. Schematic. Multiple IGFO boards can be cascaded to add additional filters. The MTC-IGFO coupled with an insert switcher create a high-quality transfer console at low cost. Relay filter selection eliminates costly multi-pole switches. Second-order filters require two switch poles per channel. A stereo transfer console with stepped switches requires two 4 pole switches to control both the high and low pass filters. A tape-to-vinyl transfer console, often requiring identical modulation plus preview channels, requires 8 pole switches. 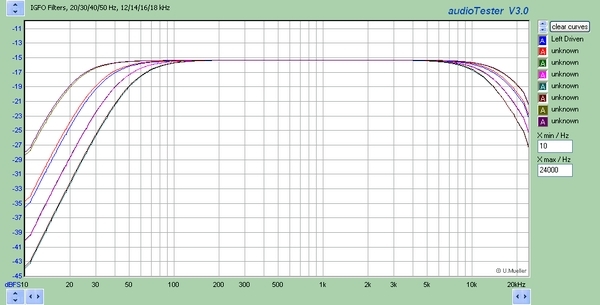 The cost of tuning a single pair of low and high pass filters by varying its component values is high. The MTC-IGFO uses a different approach with active filter stages for each filter frequency. Costly rotary switches are replaced by multiple active filter stages with their outputs switched by low-cost double pole relays. A unique insert chain places only the selected filters in the signal path. With the MTC-IGFO, a single pole rotary switch can tune several channels. Filters customized for your unique workflow. 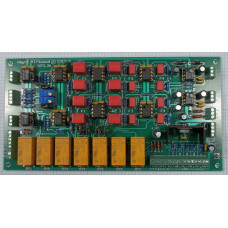 Each MTC-IGFO board has four stereo filters which, according to assembly and jumper placement, can be all high-pass, all low-pass or two high-pass and two low-pass. On-board jumpers allow the second two filters to be fed from the input or the output of the first two filters for band-pass combinations of high and low-pass. Multiple MTC-IGFO boards can be cascaded to expand the number of filters available. 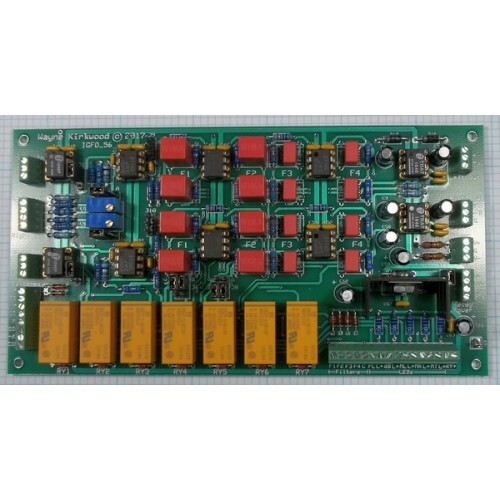 Two boards provide eight filter frequencies in various combinations of high and low-pass such as 4HP/4LP, 2HP/6LP, 6HP/2LP or 8 of all one type. Multiple boards may be cascaded actively in single-ended or fully-balanced configurations or passively to avoid additional circuitry. Some examples high-pass filter frequencies are 20, 30, 40 and 50 Hz. Common low-pass frequencies are 12, 14, 16, 18, 22 and 27 kHz. (Second-order 12 dB/octave Q=0.707) The filters are unity-gain Sallen-Key topology with custom frequency or Q set by the builder. 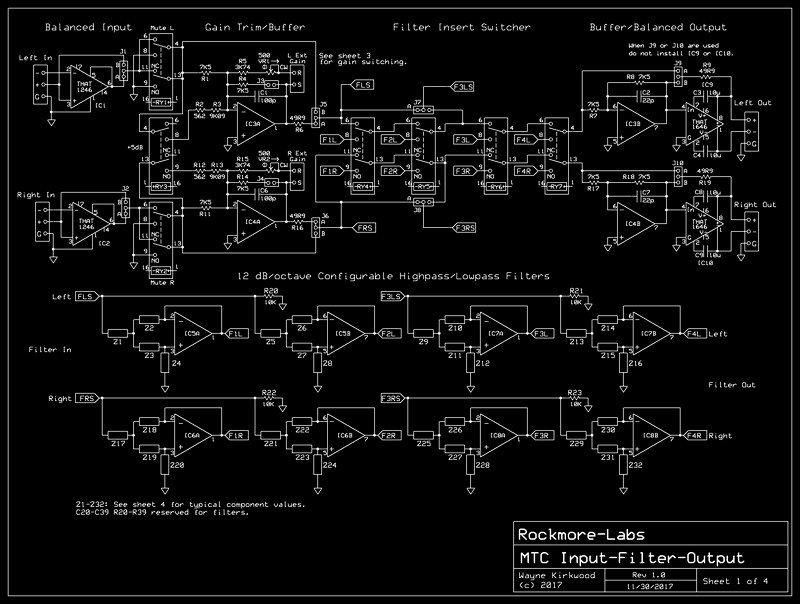 Configuration of the filters to either low or high-pass response are done by component placement during assembly. Example filter configurations and component values are provided in the documentation. Example 20/30 Hz high-pass and 22/27 kHz low-pass filter using a single MTC-IGFO. 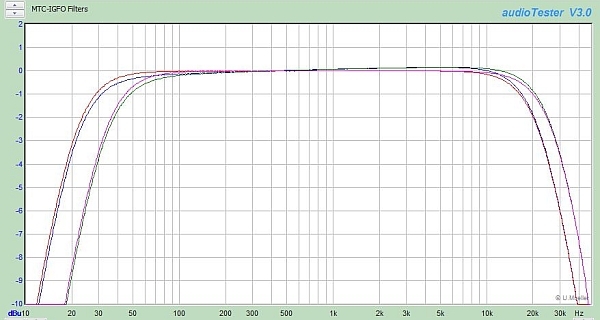 20/30/40/50 Hz high-pass and 12/14/16/18 kHz filter for tape-to-vinyl transfer using two MTC-IGFO boards. Balanced outputs drive the Insert Chain. The MTC-IGFO has fully-balanced THAT1646 OutSmarts line drivers to feed the insert chain. When feeding cascaded boards the THAT1646 may be bypassed to provide unbalanced active or hard-wire connections to the preceeding board's filters. The MTC-IGFO has numerous jumpers to provide Swiss Army Knife features. One set of jumpers bypasses the active inputs and outputs to passively cascade boards. A second set of jumpers allows the last two filters to receive their inputs from the first two rather than the input to allow combinations of high and low pass. An optional on-board relay voltage regulator is available for unregulated or higher voltage supplies. Five current-limited outputs are available for LED switch illumination of Filter On, +5dB gain and Left/Right/Stereo Mute. The KA-Electronics MTC-IGFO is sold as a bare PC board, a "kit" including semiconductors, or an assembled and fully-tested module. MTC-IGFO Assembly and Test Instructions, Schematics pdf. MTC-IGFO Build thread at the Pro Audio design Forum. A Mouser Electronics Project Manager bill-of-materials is available for DIY builds of the MTC-IGFO.